That's right, they just don't make them like this anymore. Located on the Los Altos side of El Camino, but still within walking distance of Downtown Mountain View, Miramonte Park is an exclusive collection of 58 single-family homes that evokes the romantic character of the great California neighborhoods of the 1920's and 1930's. Nearby, in addition to Downtown Mountain View with the premier performing arts theater on the Peninsula, there are outstanding schools and excellent parks. 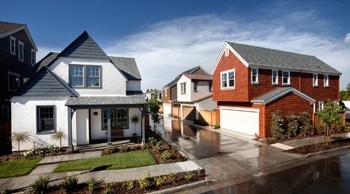 On-site, the period architecture encloses elegant, state-of-the-art homes; in addition, a neighborhood park aligning Permanente Creek provides a generous gathering place for Miramonte Park community life.